Another month, another change in the status quo for Superman's powers. In today's Action Comics #49, the Man of Steel is back in action, having thrown himself on a giant pile of Kryptonite in the hopes of jumpstarting his super powers, which have been greatly diminished and acting up since he used his Solar Flare at the beginning of the Truth storyline. But there's a bit of a hiccup. 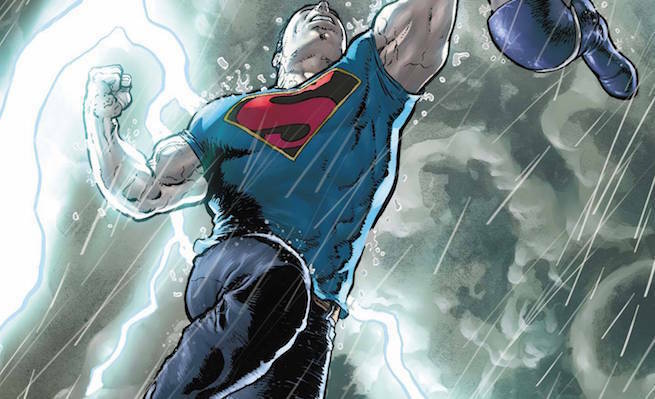 When Superman is back up to speed, he's feeling things a little...differently. Kryptonite has built up in his cells, giving him green eyes rather than his standard blue -- and a new power has emerged. It's a variation on his super-hearing, in much the same way his super flare was a variation on heat vision. In the past, he's always been able to see radio waves and different signal frequencies, but he wasn't able to hear what was on them. Mostly. Like anything else, that could change depending on the writer and their intepretation of his powers. At any rate, Superman can now receive and interpret signals, hearing what's being broadcast. It's a power he's had before -- memorably when he had his "electric" powers and blue skin and hair in the late '90s -- but this is the first time it's been added to his standard Superman arsenal. It's probably also worth noting that with the hair and the messed-up eyes, Superman looks a bit like The Eradicator did in Superman #82 back in 1993. In that issue, Superman has no powers -- but gets them back when he's bombarded by Kryptonite radiation, its radiological makeup changed by passing through The Eradicator en route. 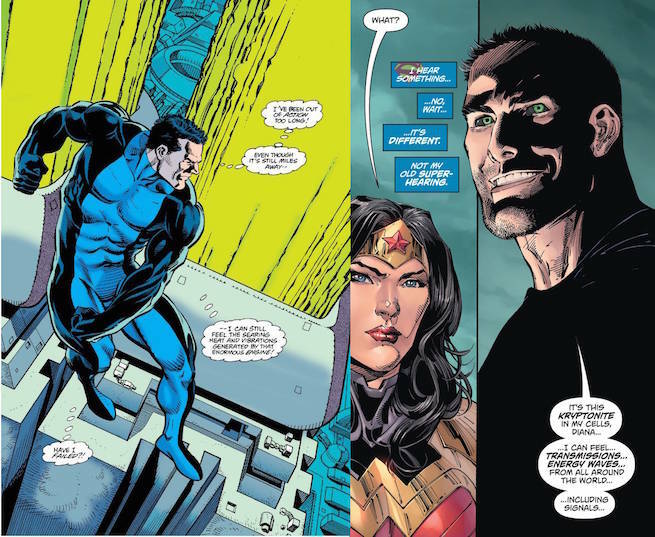 ...So having such a similar visual come up in this week's issue, where Superman is "powered back up" by Kryptonite, seems like an interesting coincidence.